Perler Fuse Bead Activity Bucket Just $6.59! You are here: Home / Great Deals / Perler Fuse Bead Activity Bucket Just $6.59! 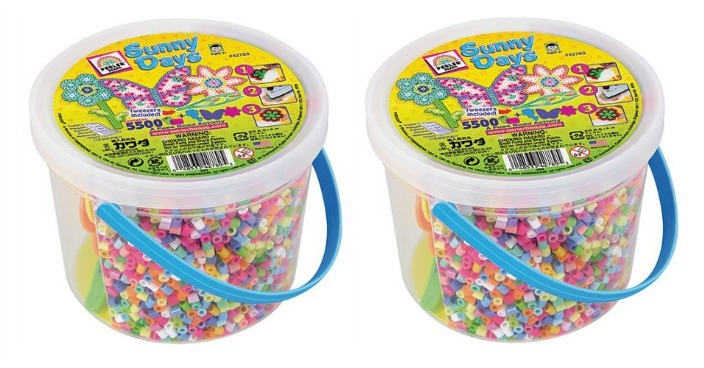 Right now you can get this Perler Fuse Bead Activity Bucket for just $6.59 at Walmart! Encourage your child’s creativity with the Perler Beads Sunny Days Activity Bucket. This sunny kit comes with 5500 bright, colorful beads and three Perler bead pegboards in butterfly and flower shapes. Your child arranges the beads on the pegboards, then you can fuse them together with a household iron. This do-it-yourself kit for kids helps your child develop hand-eye coordination, fine motor skills and color and shape recognition. The Perler fuse-bead bucket activity kit comes in a clear resealable bucket with a handle for easy storage and transport. It is designed for children 5 years old and up.